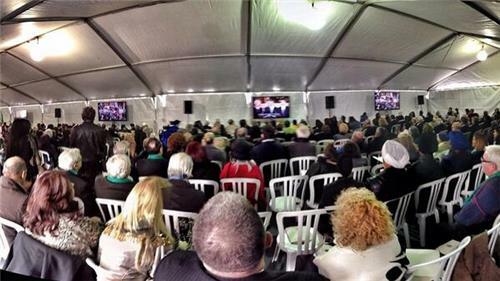 Live updates from CTV News reporters covering the Jim Flaherty funeral. 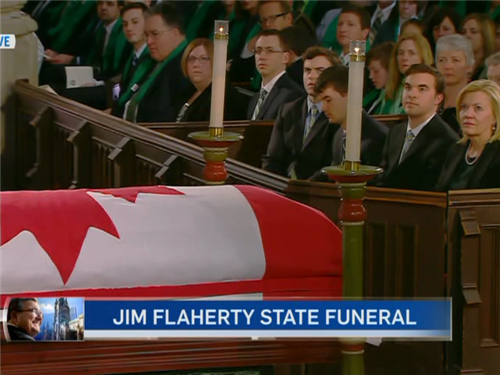 Flaherty's sister Nora says while Jim Flaherty was the youngest brother, he held his own while wrestling his four older brothers. Nora Flaherty says a young Jim Flaherty was once found throwing pennies in the garbage, when asked why he said "they're not worth anything"
Here comes Jim Flaherty's wife and triplet boys. Have your kleenex ready. 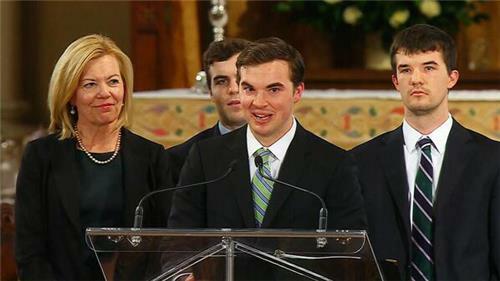 Flaherty's son says that Flaherty was the best father they could ever ask for, that he taught them how to be real men. Quinn Flaherty says that his father told him a man should have four things in his life: friendship, family, faith and love. Quinn Flaherty: "Dad, we love you... put your feed up, put your head back and relax, we will take it form here." Galen Flaherty abt 2 versions of Flaherty "the relaxed version of Jim, and the slightly LESS relaxed version of Jim I sometimes brought out"
Galen Flaherty says he feels his father with him now more than ever and that he hears his voice telling him to wrap it up. Chirstine Elliott says that Flaherty worked hard to ensure that those with disabilities were given a hand up, and included. Elliott says that John probably knew this best, they were very close. John is the Flaherty triplet who has a disability. All three sons stop to place their hand on their father's casket.